In the far future Earth is running dangerously low on magnezite, a very important element for our civilization's technological needs. 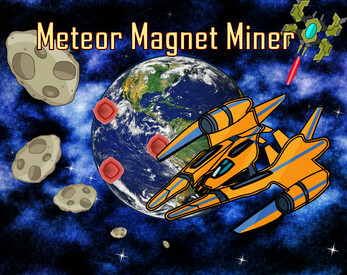 Luckily, magnezite ore is abundant in a nearby asteroid cloud. You must fly the USS Oersted, a specialized magnetic mining craft, to collect as much magnezite as possible and return it to Earth. Space bar will temporarily demagnetize your ship, causing your collected magnezite to detach itself from your craft. Fly close to any magnezite ore (the small red ones) and it'll start orbiting your craft. While hovering over Earth, press Space to deposit any magnezite orbiting around your craft. Don't forget to press Space again to turn the magnetism back on after the cooldown's recharged. Special thanks to Patrick Kegel and Backyard Brew for organizing and hosting this event!